By sarah on January 1, 2013. 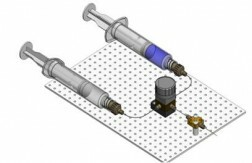 Microfluidic fluid circuits can include more than a chip! CapTite™ connectors allow a modular approach to microfluidic circuit design so that fluid circuits with specific functions can be constructed on a breadboard with tubing. These circuits can stand alone as microfluidic tubing circuits or connect to a microfluidic chip or even directly into a detector. Examples of an injector, a centrifuge and a reactor are shown along with the instructions for building the fluid breadboards. Examples shown use manually driven components but could be automated using the LabSmith uProcess™ system.